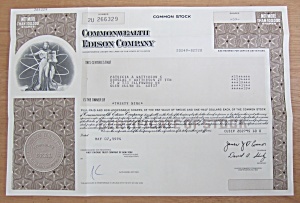 This vintage original stock certificate from May 7, 1994 is for Commonwealth Edison Company. This Stock Certificate is in very good condition. It measures approx. 12 x 8 and is suitable for framing.